It would appear that Darksiders: Warmastered Edition is well and truly on the way to Nintendo Switch, after what appears to be something of a slip up by publisher THQ Nordic. The Warmastered Edition, which is an enhanced version of the series' first game that has already seen a release on Wii U in the past, has been rumoured to be coming to Nintendo's latest console for a while. 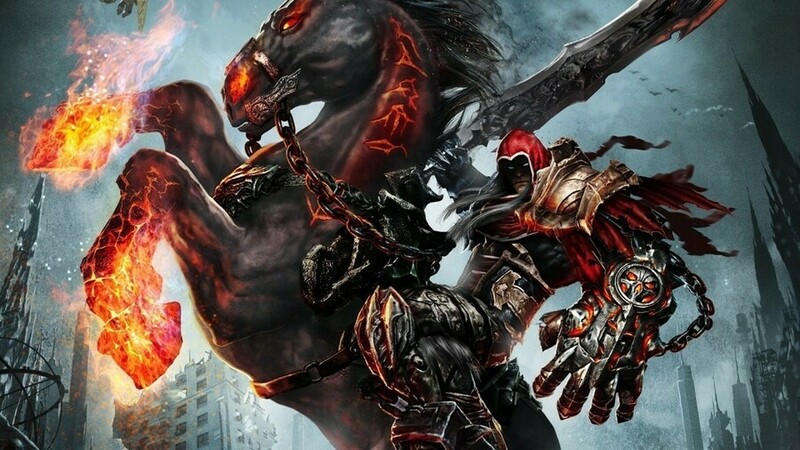 Earlier this month, a tweet from Darksiders' Twitter account seemed to reveal an upcoming release, before THQ swiftly moved in to talk down the possibility. Now, though, a new trailer has been spotted which clearly features the Nintendo Switch and Nintendo eShop logos on its end screen. The video was reportedly accessible directly through THQ Nordic's website but has since been removed, although the folks over at Vooks.net managed to capture it and rehost it on YouTube. Whether or not the video will be forcibly removed under any copyright claims is uncertain, so give it a good watch now while you can. Would you be up for playing Darksiders: Warmastered Edition on Switch? Do you think the official reveal is close? Share your thoughts with us in the comments below. This has always been a series I thought I would enjoy but other games always got in the way. I would 100% try this on switch if it runs well! Man, definitely hoping this is the start of us getting all three on the Switch. I'm actually finishing games on this system, and that's one I've always wanted to get to. Honestly I would not mind if the bulk of the PS3 and X360 libraries were re-released for the switch. Tons of games I never got to play due to not having time to sit in front of the TV. Switch is the only way I got to beat Skyrim’s campaign. Hm, cool. I never did find a retail copy of this for wiiU, ever. Was just about to finally play #2, wonder if that's in the old switch pipeline too. Let's hope this runs better than the Wii U version, which apparently was something of a technical mess. Let's keep the train of definitive Switch editions rolling! If it’s not 8K and 266Hz I’m not interested. If this comes to the switch I would definitely buy this. I did not get for the Wii U because it didn't make sense. I enjoyed it enough that I would definitely double dip on this. I hope THQs next switch game is saints row 3 though. Still the best game in the series, Joe Madureira's artwork in this part of the series truly is second to none, and the remaster was already done pretty well on the Wii U, so I'd imagine that they'd at the very least be able to let it run equally good on the Switch, if not better. Might just triple-dip, depending on the price, and depending if they're going to complete the trilogy on the Switch. I got it on PS4. But I would buy it on the Switch instantly. Also Darksiders 2 please! With every article about THQ, I'm just gonna post, "Battle for Bikini Bottom HD when?" Nice to see more ports on the way. Fantastic series overall. Really hope they bring the other 2 over, really enjoyed 2 the most. Hopefully they make enough to justify making part 4 eventually! I played mabey half of the original on Xbox one and started playing other things and never went back, however I enjoyed what I did play and would gladly buy the Remaster for Switch day 1. @JackEatsSparrows yeah I can’t wait! Hahaha. I’m just saying I hope it’s the next game they plan on releasing. Darksiders is great and all but I want my portable saints first. One more victim of the supposed January Direct. I played this a long time ago on a bad computer at 20fps. Still loved it. Probably going to give it another go. 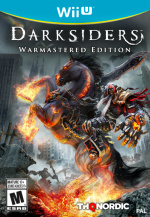 Loved this game and would be shocked if Darksiders 2 doesn't also get ported considering THQ seems to want them both on every console under the sun! @beazlen1 It barely hits 20Hz at points on X1X, don't worry, the Switch version is fine. I got this for pennies on WiiU eShop in December. Actually quite enjoyed what I played. @NEStalgia for this type of game anything stable above 20Hz will do it for me. That’ll give it a nice cinematic feel while still being perfectly playable. Just like good old N64 games! Still the king in my eyes! @beazlen1 Yes, and I demand that my toaster toasts bread in crisp 4K! Lol oh my gosh, they need to lay off “the sauce” at work. Now be silent and receive my currency. Darksiders will be perfect for switch, playing docked or on the go hopefully darksiders 2 and 3 also make it to switch. I like the artstyle here. @Tharsman Really not sure why you're getting so much hate. The PS3 and Xbox 360 had a lot of amazing games that deserve to be ported. Man, I'd go for that. I remember getting it for my kids when it first came out on Gamecube, and then playing it as much as they did! Get a remaster and in a couple years my granddaughter can play it. Love Darksiders. My favorite is Darksiders 2. Second would be Darksiders 3, and third would be Darksiders 1. They're all fantastic though. This is the THQ game I have been waiting on, Woot! They did it on purpose, just like the Darksiders twitter "accidentally" leaking it a week ago. So obviously calculated. Darksiders games are pretty good. A perfect release at the beginning or end of a console's life but not something I can get excited about or have an interest in replaying. @Tharsman There are a ton of 360 games I'd be down to see again. I'd play the crap out of Last Remnant on Switch. Also, notifications for achievements can be turned off if they irritate you to such an extent. @Tirza I know right! Wish publishers would stop trying to sell games to us like we are a bunch of Sony fans. Nintendo gamers tend to appreciate the gameplay more than the graphics. @Indielink "Also, notifications for achievements can be turned off if they irritate you to such an extent." Last time I checked, Xbox and PlayStation both only offered a complete disabling of notification popups, not just achievement/trophies. Even then, It's hard to explain, but just knowing they are there messes with my brain cogs. Honestly, the switch feels so relaxing without any of it. @ilikeike Yeah, the Wii U version is a mess! Worst I've ever played when it comes to game breaking glitches. It was definitely playable between the glitches, but I eventually gave up on it. If they fix it for the Switch, I might give it another chance. That’s nice but I won’t bite until 3 goes to Switch as well. Only ever played two on the Wii U so I’ll probably grab this straight away. Most people I talk to prefer this over the second and third game. If it is a physical release I would buy it. I have it for the PS4 through a humble bundle deal and am slowly making my way through the game. This was always my favorite. Cant wait to play it again on Switch. The same thing happened when they announced diablo 3 for the Nintendo switch, so whether taken down or not will make it's way too switch. Since I have this on PS4 and still haven’t gotten around to playing it, I won’t be double-dipping. But expanding the Switch’s library and making more games available on a portable for the first time is always a good thing! Both the wife and I beat the WiiU Darksiders 2 without issues...There was one crash when we started playing it and no other issues. Darksiders 2 was an awesome game on the WiiU. LOVED IT! Hope both of them come for the switch! I've actually had more issues with Diablo 3 on switch(that I love playing)...than I ever did with Darksiders 2 on the WiiU. Yes! I’ve been waiting for this for ages. I only hope that it’s physical, fairly priced (please, no full price for this) and the second game (even the third) is not far behind. Darksiders 2 should be coming as well. Not too sure Darksiders 3 will unless the ports of the first 2 do really well. I doubt THQ wants this game to flop twice. I think I got one of the Darksiders games on Xbox 360 for my birthday years ago. Never played it, and it got stolen with everything else. I guess now's a good time as any to see what the fuss is about. Great! Start bringing that trilogy over! De Blob 3, THQ. When?